We all know the Greek myth of Narcissus — the attractive man who was lured by Nemesis to a pool. Narcissus, fatally falling in love with his own reflection, drowned. But what would a 21st-century Narcissus myth involve? I suspect it would include a smartphone, selfies, and crossing the street without looking. 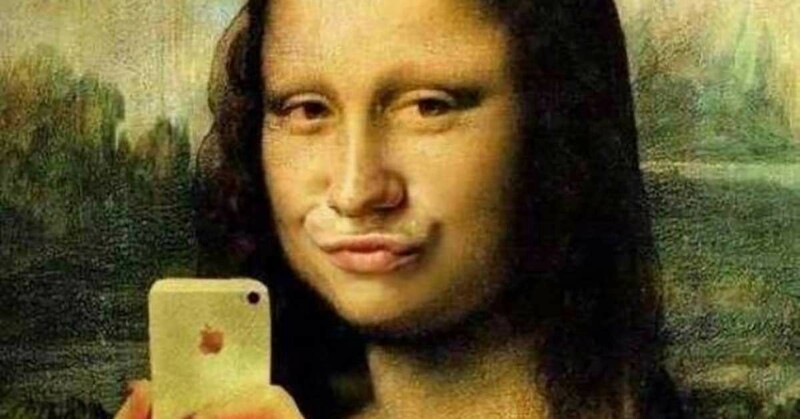 Although selfies became ubiquitous during the latter part of the last decade, self-portraiture has a much longer history, even dating as far back as Ancient Egypt. However, it was not until the mid-15th century that this style grew in popularity. This was aided by mirrors improving in quality and becoming more affordable, as well as the rise of artists using self-portraiture as a marketing tool to display their artistic talent. However, selfies and self-portraiture differ on several fronts. Firstly, selfies are by design “throw away” pieces. They’re not hung on a wall, they’re posted on a wall — a Facebook wall. Secondly, self-portraiture highlights the talent of the artist, whereas selfies, more often than not, highlight one’s lack of artistic talent. And lastly, selfies frequently celebrate the ordinary, the inconsequential, and the mundane. For millennials, the question isn’t “Does this moment warrant a selfie?” but “How long has it been since I last posted one?” Selfies have become an online heartbeat — a beacon of activity that isn’t given a second thought. But Christians are called to live wisely (Ephesians 5:15). We are those who do give things “a second thought.” So does the Bible say anything to help us in the midst of the selfie generation? Let me begin by stating something clearly: the Bible does not forbid the taking of selfies. I have taken (and do take) the occasional selfie. But depending on the setting, and their frequency, selfies can be a lens that reveal a lack of wisdom or serious underlying sin. Imagine a modern day crime show. The investigating team has their eye on a suspect and receive the appropriate warrant to search the suspect’s premises. Upon opening the door to his apartment, they find themselves standing in the middle of a very eerie scene. Every wall is covered, from floor to ceiling, with small, square photographs. After a closer inspection they notice a common theme: the subject of every photograph is their suspect. In fact, they’re selfies. What would be your first impression of that man? Is he psychotic? Self-obsessed? Narcissistic? Clearly you’d recognize something wasn’t right. Yet, there’s often very little difference between what was found on that man’s walls and what we would find if we browsed the Instagram feed of many Christians today. When Jesus said, “You shall love your neighbor as yourself” (Matthew 22:39) He implied that we all do love ourselves. However, that was not an endorsement of narcissism and pride. The Bible is pervasive in its presentation of the Christian life as one of dying to self (Matthew 16:24), serving others (Mark 9:35, Galatians 5:13), and serving God (Romans 1:1, 1 Corinthians 7:22). God says He hates “pride and arrogance” (Proverbs 8:13). Unlike humanism, Biblical Christianity is outward focused. It isn’t me-centered. Our message is, and our life should be, God-centered. Men and women have value, but as R.C. Sproul says, our dignity is “derived, dependent, and received… In and of ourselves we are of the dust.” We have value, but only because we are made in God’s image. Should we outlaw selfies? No. Selfies have not made us a more narcissistic people. They have simply brought into focus the depths of our narcissism. And it’s this selfsame narcissism for which Jesus died. But the selfie generation does need to be reminded that what is considered “normal” practice today wasn’t normal only several years ago. Technology didn’t offer the ease to capture and share photographs. Services like Instagram and Snapchat didn’t exist. So before you next say “Cheese,” give it a second thought. Ask yourself, “Why?” And have an answer. For there is no standing still in the current of the culture. Either you’re being pulled down stream or you’re swimming up it. And the latter takes effort. And while it’s not always wrong to go down stream, as Christians who are called to live holy and wisely, any action that takes us down stream should be considered carefully and soberly.